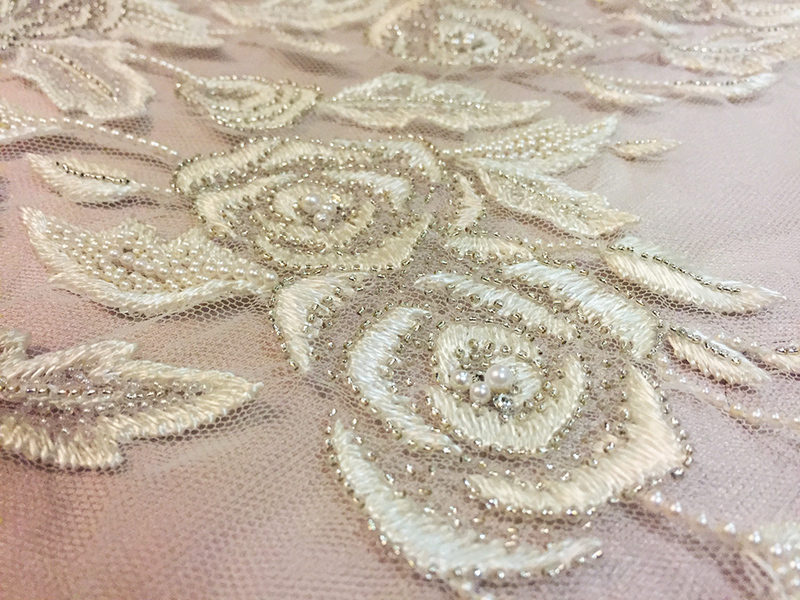 Each embellished gown starts out as a hand drawn textile design which is then transformed into embroidered fabrics by skilled artisans at an Atelier in India. Each bead and embroidery thread is sewn by hand in the ancient tambour beading tradition. Intricate silk and metallic thread work, crystals, sequins, faux pearls, and silk floral appliques are combined with flowing silk chiffons and English tulles to create an aesthetic that is simultaneously light, airy, and glamorous. After being sewn, the embroidery is again reapplied at the seams, to make sure there are no breaks in the pattern. Back in NY, each gown is inspected for perfection and finishing touches are added. Marina, owner and creative director, studied fashion design at Parsons School of Design and worked in the NY fashion industry for almost ten years before embarking on her own venture. Designing a bridal collection was never a thought before her own wedding made her consider how her love of craftsmanship and effortless style can be combined into a wedding gown. Marina's love of textile design led her to create a bridal collection where each gown is customized with unique hand embroidered patterns, starting out as a hand drawing in Marina's sketchbook and evolving from there.